Meetings are held monthly on a Friday morning from 7:00-7:30 AM. Friday, September 14, 2018 in the IMC -- No Mini Service Project today. Friday, October 12, 2018 in the IMC -- Mini Service Project today is cutting ornaments for Serve 6.8. Friday, November 9, 2018 in the IMC -- Mini Service Project today is making scarves for United Way. Friday, December 7, 2018 in the IMC -- Mini Service Project today is creating holiday cards for United Way. 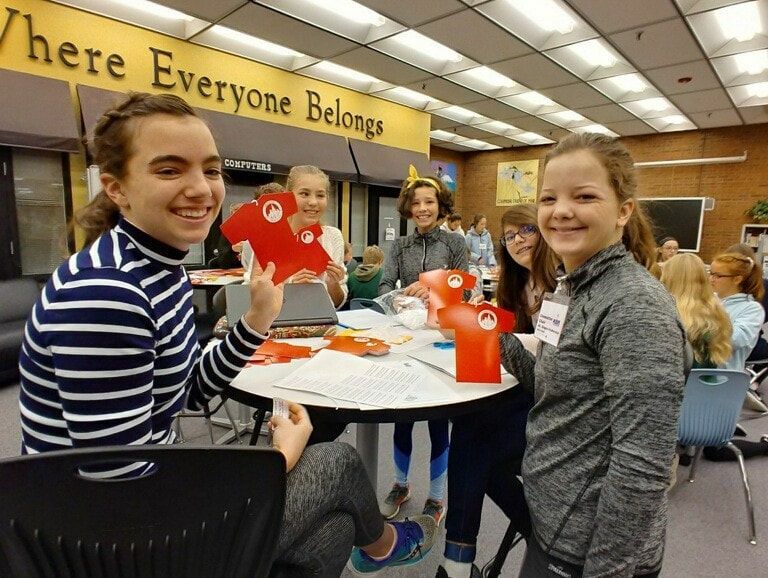 Friday, January 18, 2019 in the IMC -- Mini Service Project today is making laminated placemats for the Community Impact Partners in Larimer County. Friday, February 15, 2019 in the IMC -- Mini Service Project today is making ABC Flashcards for kids in need. Friday, March 15, 2019 in the IMC -- Mini Service Project today is building first aid kits for local homeless. Friday, April 5, 2019 in the IMC -- ? Friday, May 10, 2019 in the IMC -- NJHS End of year celebration! Scholarship: Students must have a minimum cumulative non-weighted GPA of 3.3 at the end of the 6th and 7th grade years only. 8th graders may not be inducted. Leadership: Student leaders are those who are resourceful, good problem-solvers, promoters of school activities, idea contributors, dependable and persons who exemplify positive attitudes about life. Leadership experiences can be drawn from school or community activities while working with or for others. Service: This quality is defined through the voluntary contributions made by a student to Boltz or to the Fort Collins community, done without compensation and with positive, courteous and enthusiastic spirit. Members are required to complete and submit a minimum of 10 hours of community service hours annually. Citizenship: Candidates must demonstrate an understanding of the importance of civic involvement, have a high regard for freedom, justice and respect for the American form of government and demonstrate mature participation and responsibility through involvement in school clubs and community organizations. Character: A student with character must demonstrate the following six qualities: respect, responsibility, trustworthiness, fairness, caring and citizenship. Candidates will be selected on their ability to demonstrate and uphold these standards. The student of good character upholds principles of morality and ethics, is cooperative, demonstrates high standards of honesty and reliability, shows courtesy, concern and respect for others and generally maintains a good and healthy lifestyle. Academic Review: Once a candidate has been inducted, he/she is responsible for maintaining a 3.00 cumulative GPA. Mrs. Morris will review grades at the end of each semester. Members who fall below the required GPA will be given a warning as soon as quarter grades become available. If students fall below the minimum GPA for two grade checks, that student might be removed from NJHS. Discipline Review: NJHS members are expected to demonstrate exemplary behavior. Students who have an upper level discipline issue in grades 6 and/or 7 will not qualify for acceptance into NJHS. If an NJHS student has an upper level discipline infraction while a member, the student will go on probationary status for at least one quarter. While we do not anticipate that our NHJS members will encounter any problems with academics or behavior, probationary status is intended to provide a second chance to remain in good standing. If a student falls below 3.00 during a marking period, the student will be on probation and will have one marking period to raise the GPA to the 3.50 minimum. If a student receives a Discipline referral, the student is on probation for one grading period. **** NJHS members may have only one probationary period during their middle school membership. Additional issues with grades or discipline will result in removal from NJHS. Once a Boltz student has been inducted, he/she is required to do at least 10 hours of community service/volunteer work each school year. Students will submit NJHS Service Hour Verification Forms throughout the school year to the NJHS advisors to keep track of their community service hours. NJHS students should also keep a Personal NJHS Service Hours Log Sheet to track their hours as well. Here are some examples of eligible Service Hour/Volunteering activities—helping with food and clothing drives, helping with charity races in town, church projects, working at a soup kitchen, volunteering at a nursing home, volunteering at an animal shelter, service done through Scouts or school clubs, working at an elementary school event, helping with the Boltz Fook Fair, volunteering at PVH or the public library, etc. Here are some examples of activities that do NOT count as NJHS Service Hours—being in band, choir or orchestra, babysitting, going to confirmation classes or being an alter server at church, working on a political campaign, being on a sports team, being a WEB leader, being in AVID, taking care of a neighbor’s pet, etc.